The New Apex Learner is an upgrade to our original Learner brand, and currently has seventy eight 5* reviews on Amazon. This is an exceptionally versatile microscope that can be used to look at slide preparations up to x800 magnification and also whole objects - illuminated by the incident light unit at magnifications up to x150. 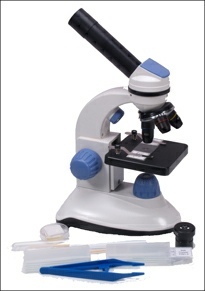 This allows the examination of objects without the need to make slides. Two LED lighting systems - underneath for slides and downward facing for whole objects. coverslips and tools to get you started.